I enjoyed this novel very much. 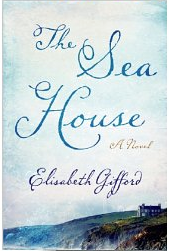 It’s Elisabeth Gifford’s first and she is a fine storyteller. This one will sweep away the cobwebs and give you a look into the Scottish Island of Harris – wild, incredibly beautiful and high up on my bucket list. If I could live anywhere, I’d live in a house with the sea at my door (maybe back just a little to allow for global warming). I’m never happier than when I’m by the sea or in the sea – no matter how cold the water. Yesterday, I even put ocean waves on my Spotify while I was working – because I live in the middle of America where there’s not much surf to be found. If I could, I would live in Elisabeth Gifford’s Sea House on Harris in the Hebridean Islands. In 1976 Ruth and her husband Michael are renovating the dilapidated Sea House on Harris. For Ruth, the house and the island are a return to her mother’s birthplace, something of a homecoming to a home she never had. While working on the house they find a body of baby with what looks like a fin, buried under the floorboards. A Selkie child? The dead infant haunts Ruth and adds to the dis-ease that Ruth experiences on the cusp of becoming a mother. She carries a child, but she also carries the weight of a rootless existence as an orphan raised in the urban welfare system, the pain of the loss of her mother, and the abandonment by her unknown father. Ruth clings to family lore that she is descended from the Selkies. This belief leads her to learn more about the home’s previous inhabitants. She finds story of Alexander Ferguson and Moira, his servant in his journals, church papers and historical accounts. In 1860 Moira works in the Sea House – then the manse for the island’s Reverend Alexander Ferguson, who has saved her life after the loss of her family in the Clearances. [Highland Clearances of the 19th century destroyed communities throughout the Highlands and Islands as the human populations were evicted and replaced with sheep farms.] Moira is quietly devoted to the Reverend in a way that reminded me of a Dickens novel. Alexander is a bit of a scientist – he is fascinated by the possibility of a missing race of people – Selkies – from whom he believes he is descended. As much as Moira loves the Reverend from afar, she hates Lord Marstone – whose clearance of land led to the loss of her family. She plots revenge on Marstone even as his daughter gets uncomfortably friendly with the Alexander. And the baby? I can’t spoil it for you. But it is good. This entry was posted in Book Review, Fiction, Historical Fiction, Scotland and tagged book review, elisabeth gifford, historical fiction, Scotland. This sounds so fascinating. The idea of two entwining stories, one in the past and one in more recent days (although here the ‘recent days’ story is still historical) is hardly new, but it sounds like the author found a very intriguing way to handle it.